The Lake Norman Chamber of Commerce Board of Directors has voted to endorse several bond packages before North Mecklenburg voters on November 5th. The Chamber is encouraging its members to VOTE YES for the Charlotte Mecklenburg School Bonds and the Central Piedmont Community College Bonds before Mecklenburg County voters in the upcoming referendum. Chamber members who are registered voters in the Town of Cornelius are also encouraged to vote for the three municipal bonds on the ballot. These bonds will be the topic of the next Focus Friday on October 18th at the Chamber. Current CMS school board representative Rhonda Lennon (District #1) and Carrie Kester, Chair at Community of Huntersville Education Collaborative will provide more information regarding the bonds. Read more about the Bonds and the Chamber’s position here. The Chamber will host a candidate forum in Davidson and Huntersville next week. A forum was held in Cornelius October 1st. The two-hour forum will be held at the respective town halls. The forum for Davidson is Tuesday, October 15th and Huntersville, Thursday Oct 17th. All forums are 7:00 – 9:00 pm. The events are moderated by Jerry Hancock, General Partner of Alexander Hancock Associates. Hancock is well known in Charlotte as a guest commentator on “All Things Considered,” National Public Radio, and the publishing of numerous journal articles. For over 25 years he hosted programs on public television including FINAL EDITION on Channel 42, a weekly roundtable discussion of current news topics with local reporters. The forum in Davidson is co-sponsored by Davidsonnews.net and the Huntersville Forum is co-sponsored by the Lake Norman Political Association. For more information, read about it here. The Lake Norman Chamber of Commerce will host the eighth annual salute to North Mecklenburg Public Safety officers and volunteers at a special luncheon Thursday, October 17th at noon at the Peninsula Club (19101 Peninsula Club Drive) in Cornelius. The event, Presented by Wells Fargo Bank, is sponsored by Central Piedmont Community College – Merancas Campus and The Herald Newspaper. An officer from the Cornelius, Davidson, and the Huntersville Police Departments will be honored as well as members of the North Meck Rescue, and the local fire departments. In addition to honoring the officers, the Guest Speaker will be Tamara Williams, the new Dean of Central Piedmont Community College – Merancas Campus. Dean Williams will touch on the role CPCC plays in training public safety officers and first responders. Join us as we salute our first responders! RSVP by calling the Chamber at 704-892-1922 or online. The cost is $16 for Chamber members. Read more about this event here. While the Lake Norman Chamber of Commerce is a non-partisan organization and we do not endorse candidates for elected office, we do believe in the principles of good government. We strongly encourage our members to actively engage themselves in the political debate in their local community, state, and nation. It is a shame that typically, only 13% of the electorate turn out to select elected leaders which will govern our communities and schools. The Lake Norman Chamber encourages you to get to know the candidates running for office at all levels and vote for those who best represent your values and that of your business. 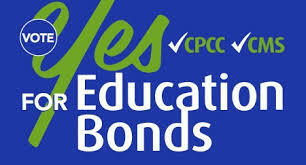 We would also ask that if you are a Mecklenburg County voter, you Vote FOR the CMS and CPCC Bonds. If a Cornelius resident, Vote to SUPPORT all three Cornelius Town Bonds. These important bonds will provide the financial resources for our roads, school, and quality of life and will be critical components for our economic development efforts and the business growth of our region. Let’s all hope looking back from the days ahead, we don’t regret the community and region we could have been simply because we didn’t take time to be informed and take advantage of our right to vote on election day. Well written, Bill! In Cornelius, we are blessed with 10 committed candidates for Town Commission, a well-balanced budget, and exciting growth ahead for Exit 28!